Own Kung Fu Panda - Characters Mug from Deff, DVD, Blu-Ray & 4K Video Specialists - Free UK Delivery..
Own Kung Fu Panda - Enlightened Mug from Deff, DVD, Blu-Ray & 4K Video Specialists - Free UK Delivery..
Brace yourself for awesome action and legendary laughs in this fun-filled animated TV series based on the Academy Award-Nominated hit movie Kung Fu Panda! As the chosen Dragon Warrior and sworn protector of the Valley of Peace, Po the panda is highly skilled, ever vigilant and hungry for justice...and dumplings. Together with the Furious Five - Tigress, Monkey, Mantis, Crane and Viper - Po must fend off fierce villains, including an evi..
Get ready for more high-kicking action and fur-flying fun in this awesome animated TV series based on Academy Award-Nominated hit movie Kung Fu Panda! He may not be your typical warrior, but Po packs an arsenal of martial arts skills as big as his heart ... and his stomach. 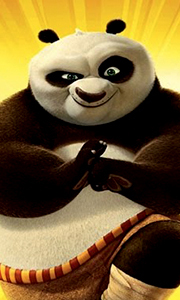 Always ready to fight for what's right, Po and the Furious Five - Tigress, Monkey, Mantis, Crane and Viper - face exotic dangers at every turn, including a pair of m..
Own Kung Fu Panda - The Scorpion Sting DVD from Deff, DVD, Blu-Ray & 4K Video Specialists - Free UK Delivery..
Own Kung Fu Panda 1 to 3 Blu-Ray from Deff, DVD, Blu-Ray & 4K Video Specialists - Free UK Delivery..
Jack Black is back as Po in DreamWorks Animation's Kung Fu Panda 2, the fiercely funny, “spectacular” (THE SUN ) sequel to the Academy Award–nominated original film. On his first big challenge since becoming the Dragon Warrior, Po must lead his friends and fellow kung fu masters The Furious Five on a mission of epic proportions to defeat his most threatening rival yet. Kung Fu Panda 2 packs a powerful punch that combines non-stop action..
Jack Black is back as Po in DreamWorks Animation's Kung Fu Panda 2, the fiercely funny, “spectacular” (The Sun) sequel to the Academy Award nominated original film. On his first big challenge since becoming the Dragon Warrior, Po must lead his friends and fellow kung fu masters The Furious Five on a mission of epic proportions to defeat his most destructive rival yet! Special Features Kickin' It With The Cast, Deleted Scenes, Sneak Pee..
Po and the Furious Five are back in the hilarious and critically-acclaimed hit film your whole family will love! When Po discovers a secret village of fun-loving, clumsy pandas, he must train them to defeat Kai, a supernatural villain who threatens to destroy kung fu. Special Features Everybody Loves A Panda Party - With Optional Karaoke With Po, Po's Posters Of Awesomeness, Panda Paws, Make A Panda Party Paper Pal, Play Like A Panda, ..
Po and the Furious Five are back in the hilarious and criticaly acclaimed hit film yor whole family will love! When Po discovers a secret village of fun-loving, clumsy pandas, he must train them to defeat Kai, a supernatural villain who threatens to destroy kung fu. Special Features Everybody Loves A Panda Party - With Optional Karaoke With Po, Po's Posters Of Awesomeness, Panda Paws, Make A Panda Party Paper Pal, Play Like A Panda, th..
Po and the Furious Five are back in the hilarious and critically acclaimed hit film your whole family will love! When Po discovers a secret village of fun-loving, clumsy pandas, he must train them to defeat Hai, a supernatural villain who threatens to destroy kung fu. Special Features Everybody Loves A Panda Party - With Optional Karaoke With Po, Panda Paws, Make A Panda Party Paper Pal, The Origin Of 'Skadoosh', Gallery Of Epic Artful..
From the creators of Shrek and Madagascar comes the funniest movie of the year! Prepare for awesomeness with Dreamworks Animation's Kung Fu Panda. Jack Black is perfect as the voice of Po, a noodle slurping dreamer who must embrace his true self-fuzzy flaws and all-in order to become the legendary Dragon Warrior. With high-kicking humour, tons of kung fu action, and groundbreaking animation, KUNG FU PANDA is a heart-warming story of cou.. In Dreamworks' Kung Fu Panda, Jack Black is perfect as the voice of Po, a noodle-slurping dreamer who must embrace his true self – fuzzy flaws and all - in order to become the legendary Dragon Warrior. With groundbreaking animation, an all-star cast and high-kicking humour, the Oscar-Nominated Kung Fu Panda is a delightful entertainment of courage for the whole family! Special Features Dragon Warrior Training Academy, Help Save The Wil..
Own Kung Fu Panda Trilogy (3 Fims) DVD from Deff, DVD, Blu-Ray & 4K Video Specialists - Free UK Delivery..
Own Kung Fu Panda - Good Croc, Bad Croc DVD from Deff, DVD, Blu-Ray & 4K Video Specialists - Free UK Delivery..
Own Kung Fu Panda 1 to 3 DVD from Deff, DVD, Blu-Ray & 4K Video Specialists - Free UK Delivery..
Own Kung Fu Panda 2 DVD from Deff, DVD, Blu-Ray & 4K Video Specialists - Free UK Delivery..
Own Kung Fu Panda 3 - Inner Peace Mug from Deff, DVD, Blu-Ray & 4K Video Specialists - Free UK Delivery..
Own Kung Fu Panda 3 - Kick Mug from Deff, DVD, Blu-Ray & 4K Video Specialists - Free UK Delivery..
Own Kung Fu Panda 3 DVD from Deff, DVD, Blu-Ray & 4K Video Specialists - Free UK Delivery..
Own Kung Fu Panda DVD from Deff, DVD, Blu-Ray & 4K Video Specialists - Free UK Delivery..